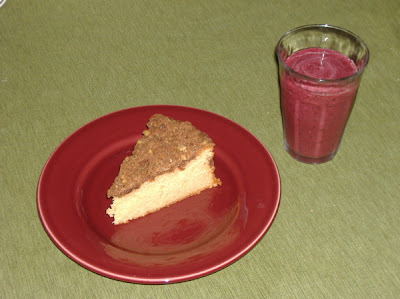 I woke up in the mood for some sort of delicious baked good this morning, and I have some plain yogurt and buttermilk on hand, so I did a quick search for some sort of coffee cake using either the yogurt (which I often substitute for sour cream in baked things) or the buttermilk. Found a recipe (yes! ), made sure I had all the ingredients (yep), and set about making it. But I read the recipe wrong, and also misjudged how much yogurt I actually had, so I ended up improvising a bit. I also modified the streusel topping. Here, with the steps cleaned up a bit, is the recipe. Combine sugars, spices, and flour in a medium bowl. Using a pastry blender or two knives, cut the butter into the dry ingredients until well blended (the pieces of butter should be no larger than small peas, but the mixture need not be entirely uniform). Mix in the chopped walnuts and set aside--and try not to nibble on it too much as you make the cake. Preheat the oven to 350F. Take out either a 9x9 square baking dish or a 9" round cake pan (make sure the cake pan is at least 2" deep, as the cake will rise) and brush it thoroughly with butter. Whisk together the flour, baking soda, salt, and nutmeg in a medium bowl. Set aside. In a large bowl, either with a stand mixer (paddle attachment) or a hand mixer, cream together the butter and sugar. Add the eggs one at a time, until well blended, and then add the vanilla. In another bowl whisk together the yogurt and cream cheese. Add the dry and wet ingredients to the butter mixture by turns, beginning and ending with the dry (3 additions for the dry ingredients, two for the wet). Don't overbeat. Spread the batter into the prepared pan and top with the streusel mixture. Bake the cake for an hour and ten minutes, or until it is golden brown and passes the toothpick test. Cool slightly before serving.